I know what you’re thinking: oh geez. Here we go again. Yet another post where she tells us about how she hates to bake but then bakes (delicious, delectable, decadent) desserts anyway. I just can’t take it anymore. I just can’t handle this gastronomical rollercoaster! Well, never fear. Because this time it’s different. I promise. I’ve changed. I’m a new person. And I’ve done that for you. I promise that I will be everything a baking-hating person should be. In fact, not only do I hate baking but I, in fact, did not bake last night. Oh sure, I mean, there’s an image of a deliciously rich dessert attached to this post. But I didn’t bake it. Honest. Would I lie to you? I told you, I’m a whole new person. No baking and I mean it. 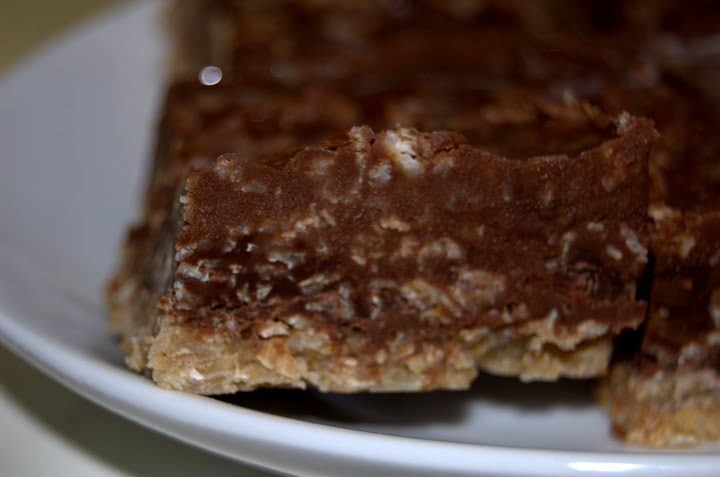 These bars are actually unbaked. For all you Twilight fans, that means this dish is like the Edward of the dessert world. But healthier looking. 1. Melt butter in a pot over low heat. Stir in brown sugar, vanilla, and oats. Cook for 3 to 4 minutes. Press half of mixture in to the bottom of a buttered 8 x 8 dish. 2. In a medium micowave-safe bowl, microwave the chocolate and peanut butter for about 40 seconds, then stir until smooth and thoroughly mixed. Pour the chocolate peanut butter mixture over the crust. 3. 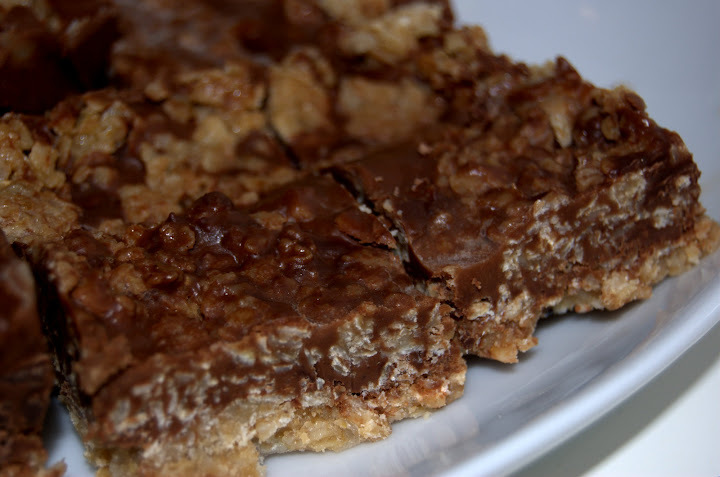 Sprinkle the remaining oat mixture over the chocolate and peanut butter, pressing gently to form a crust. 4. Refrigerate until set. Cut and serve. This entry was posted in General Musings and tagged bars, chocolate, dessert on November 20, 2009 by Lauren.